Another legislative session has come to a close with more gridlock and gubernatorial vetoes that prevented meaningful action on critical issues such as elder care, school safety and a fix for Minnesota’s broken vehicle licensing system. Both parties share the blame, and we simply can’t continue down that path any more. I’m running for State Representative to build the bridges and create coalitions of like-minded lawmakers to do what is right for Minnesota. 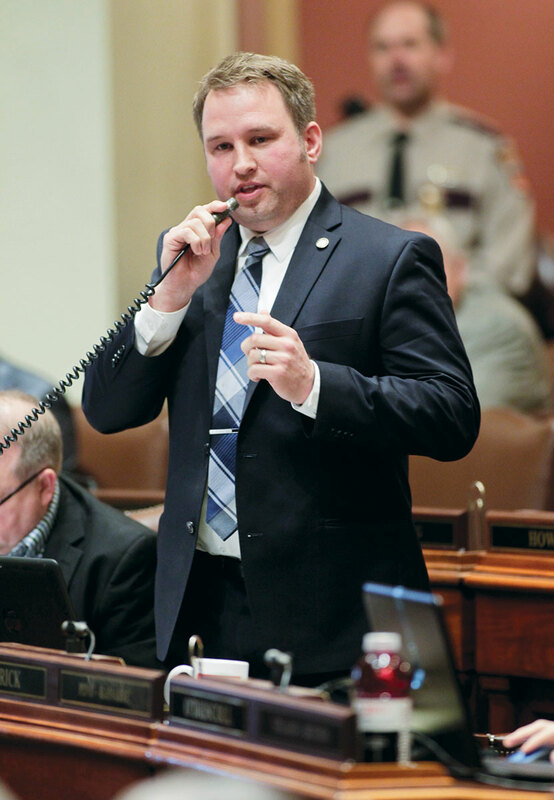 During my legislative tenure, I was ranked as one of the most bipartisan legislators in the Minnesota House. In contrast, my opponent, Andrew Carlson, has voted in lockstep with his party leaders on virtually every issue. As a lifelong resident of Bloomington, I understand the priorities of our community, and want to apply my knowledge of the legislative process to work on your behalf. I respectfully ask for your vote so I can bring principled, common-sense leadership to work for all of us. As a candidate for State Representative, please allow me to share more information about my background and why I believe my many years of living in Bloomington and small business experience will help me better serve you as State Representative. I am blessed to have come from a family with a history in the real estate business. At age 14, I began my first gainful employment mowing lawns at the Country Inn apartments at 106th and Lyndale, which were owned by my Grandpa. Every week in the spring, summer and fall, I’d use a walk-behind mower to complete the six hour job. The work was hot, sweaty and tedious, and I loved every minute of it. Three years later, at age 17, with all the money earned from my mowing jobs, my uncle and I bought a small four-plex apartment just down the street from Kennedy High School. Now, in addition to mowing, I had additional responsibilities which included shoveling, insulating, painting, maintenance and dealing with the needs and requests of tenants. After two years of co-ownership, my uncle bought out my interest in the property. I was hooked on being a business owner, and at age 19 took the test and got my real estate license. In addition to real estate, my other love was hockey. After four years of high school hockey at Kennedy, I played Junior “A” hockey for the Twin Cities Vulcans. During that time I had a screen printing/ embroidery business that made most of the apparel for the team. I remember taking bus trips to away games and working through the team’s apparel order with the coach. After four years at Bethel University, I graduated with a degree in Business and Marketing and went to work at my Grandpa’s real estate company. It was a highlight of my life working side-by-side with Grandpa. He taught me a great deal, and I owe much of my success to what I learned from him. After two years, I became a real estate broker, buying, fixing up and selling properties and learning many lessons along the way. Five years later, I opened a new business, Orange House Realty, and have been on my own ever since. In addition to selling homes in the Bloomington area, I currently own several rental properties in Bloomington. It has been a privilege for me to help many of my tenants start off as renters and then realize the American dream of home ownership. I have also had to say no to potential home buyers, instead advising them to rent first, save money and come back when they were better able to take on a mortgage. That’s not always what people want to hear, but I hope it helps teach them a lesson in saving and fiscal responsibility. I have witnessed first-hand how high taxes affect business owners and how those costs must be passed along to customers. In the case of real estate, I’ve seen renters and homeowners have to foot the bill and the struggles they’ve endured to keep a roof over their heads because higher taxes makes renting and home ownership unaffordable. I’ve dealt with increased license fees, excessive permits and inspections, leaky toilets, barking dogs, tenants who don’t pay and more than a few conversations with unresponsive utility companies serving my renters. Through it all, I’ve learned perseverance, the ups and downs of business, effective customer service and having to work hard and come up with solutions to problems. That is why I believe the experience I’ve gained will help me be a strong voice on issues such as taxes, regulations, housing, and a compassionate voice to those dealing with struggles and challenges in life. I’ve got the energy and enthusiasm to hit the ground running as your State Representative, and I’ll work hard to make a real difference at the Capitol. Between now and November 6, I will be working every day to speak with you to learn what issues are important to you. In the meantime, I invite you to contact me with any questions, comments, or suggestions. I welcome your input, want your ideas on how we can make government work for us, and respectfully ask for your vote. Chad’s parents have been Bloomington residents for over 53 years! Have a question or comment? Interested in joining us for an event? Send us your details and we’ll get back to you right away.